Kevin Page has charmed “Dallas” fans with his portrayal of Bum, the loyal private eye who helped J.R. execute his master plan. (Spoiler alert: This included executing J.R. himself.) I recently spoke to Page about his role on the show – and his place in TV history. How does it feel to be the last guy who’ll ever shoot J.R.? Well, I was honored when that script came through. It was also sort of an emotional experience because we had just finished working with Larry [Hagman], and all these issues of mortality and death were kind of fresh. So I was a little shocked. I suppose as an actor, I was also kind of pleased. I can understand that. You’re the answer to a trivia question now. Yes, I’ve been ribbed by a number of my friends. I’ve now become a “Jeopardy!” topic. How did you find out Bum was going to be the triggerman? 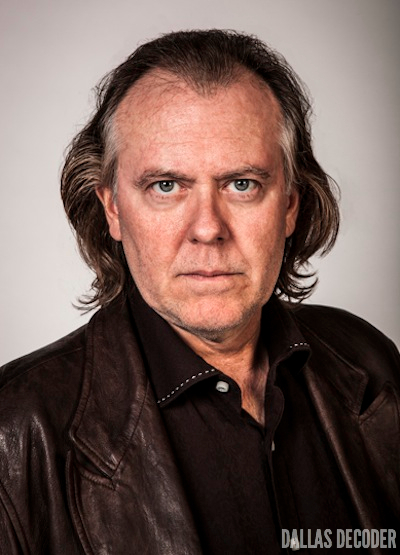 About eight weeks before we finished the season, a director pulled me aside and said, “Do you know what’s going on with your character?” And I said, “Well, no, not really.” And in order to accomplish something that was necessary in the scene we were about to shoot, he had to tell me. He took me into my little trailer and we closed the door and he gave me about a two-line indication of what was to come. What was your reaction? Were you shocked? Yes, but I also had to go out and shoot a scene where I’m walking in the cold and talking on a cell phone. So I was, frankly, a little distracted. At that exact moment, I was trying to think of other things. That’s the thing about Bum: You’re always on the phone! How do those scenes work? Does the director give you the other character’s lines and you have to react to them? Usually you have the first assistant director who holds a copy of the script off-camera and he’ll read the other party’s lines. And you just say your lines and try not to overlap. You don’t want to be talking while they’re talking. You have to kind of concentrate as an actor because you want to make that sense of communication real. Is it harder to do a scene like that as opposed to one where you’re face to face with another actor? I don’t know if there’s a “harder” or “easier.” Every day as an actor is another set of challenges, problems or puzzles. And what you want to do is solve those puzzles as best you can. You want to make sure you know your lines and you can hit your marks and get the job done so the crew can go home! 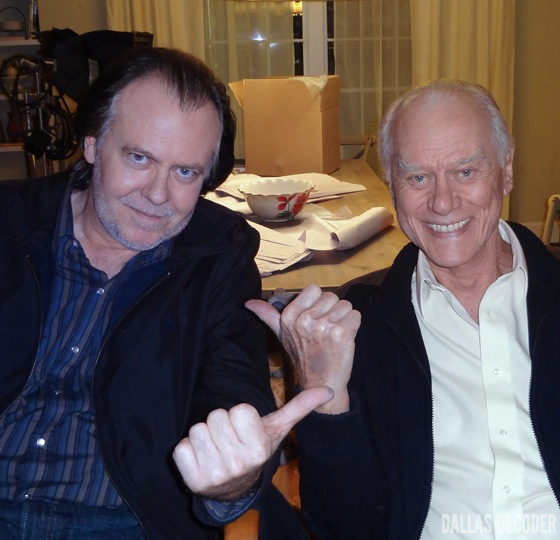 So talk to me about working with Larry Hagman. It was sort of like working with – this kind of sounds corny – TV royalty. I’ve read your website so I know I’m not adding anything new here, but Larry just had such an energy about him, that even in his 80s, he was just a stunning presence. He could light up a room. It was very difficult to describe, but the really big stars have some kind of quality similar to that. I guess you probably call it charisma. Larry had a lot of that. You could feel that firepower every time you spent time with him. As a viewer, I can see that. You could feel it in his presence as well? Oh, it was palpable. Absolutely. And he was a master actor. He was constantly cracking jokes and keeping everybody on their toes. He’d just zing you and crack up everybody. Often at your expense. I mean, the guy was a true genius comedian. I’ve heard that one of his last scenes was the one in the courthouse men’s room during Ann’s trial. That was the last scene he ever shot. And you were there for that. When you think about that now, what’s it like to know you were part of Larry’s last scene? I didn’t really know that was the case until several weeks later at the memorial. I walk in and some of the camera crew is telling me, “You shot the very last scene that Larry ever had.” … So really, honestly, I was sort of floored. It kind of gave me the chills. It seems like there was more to that scene than what we saw. In the finished product, I don’t think you had any lines. That happens a lot. The show is 42-and-a-half-minutes long. That’s pretty much a hard number. So I think everybody in the cast has given up pieces of scenes before. That’s just what you have to have if you want to have a rocking show that moves forward like a freight train, which is what I think we have. You know, I’ve been dying for somebody to ask me this question because I’ve thought about this a lot. I think the cast are the first fans. Because each and every one of us gets these scripts, and we’re reading them, and we’re laughing and crying and howling just like everybody else does when they watch the show at home. The cast is watching them on the TVs in our minds. I read a script and I wonder how Patrick [Duffy] is going to do that, or I wonder what Brenda [Strong] is going to do with that line. And then we get a chance to watch it when it airs. And we’re loving it and wanting to find out what happens next just like everybody else. I want to ask you about two scenes that I loved as a fan, beginning with the one where Sue Ellen asks Bum to track down Lee Majors’ character. I think that’s the first time we saw you work with Linda Gray. The only thing I can say about Linda Gray is that she’s just a fantastically charming and gracious woman of the cinema. She’s beyond words. And you know, there was quite a bit of chemistry between Bum and Sue Ellen in that scene. I have no inside information! Well, we absolutely have something going. Linda Gray is one of my very favorite actresses of all time and somebody I just adore working with. I hope that comes out when we share a screen together because she’s just fabulous. Yeah, she is. Let me ask you about the big scene where it’s revealed that Bum is the “Who Killed J.R.?” triggerman. What was it like to film that? That actually makes me recant my earlier comment about there are never any hard days as an actor because everybody on the set that day was particularly pumped up to try to make that real. Not only was it a scene that was important to the character that we all loved as “first fans,” but also it was our final salute to Larry. So we were really wound up and I spent probably eight hours that day weeping. Oh, wow. Well, you’re fantastic in that scene. Thank you very much. I appreciate that. I was proud of that. And Patrick was great too. Oh, Patrick was just off the hook. He was like a man possessed. He was amazing. It was easy to cry because you’re listening to this guy and he’s just tearing your heart out. So that took all day to film? Oh yeah, we were probably there six or eight hours, I think. And the whole thing was very secret. None of the crew had really seen the script, so a lot of people were really shocked that it was coming out as we were going along. Usually the crew is a pretty jocular bunch. It’s one of the great Texas crews. They’ve all worked together on various things for 25, 30 years. And everybody knows each other. We’re all pretty close, I think. But on that day, everybody was putting their head down and making it happen. Boy, I think we got results. You sure did. So will Bum be back next season? They literally don’t tell me anything. But I say between you, me and my mom, I’m voting he does come back! You know, I think Bum would fit in well with the TNT lineup. I think we need a Bum spinoff. “The Bum Chronicles”! We’ve talked about it as a joke on the set. Even if it doesn’t happen, you have a nice second career going as an artist. Tell me about that. It’s a strange story. A couple of years ago, I was presented with this opportunity by a scientist who had a robotic platform for painting in pointillism, which is a style of painting with thousands of little tiny strokes of paint that look like dots. And I thought that was so fascinating both as a business and as an artistic thing because I’ve been a painter and sculptor for years. So I took that on and ended up being the only person in the world to own this robotic platform. I now control four patents on the technology software and to my knowledge, I’m the only painter in the entire world that’s painting in monumentally scaled pointillism. So I’ve got an art dealer and I’m selling paintings. It’s been this crazy, unique thing. So that’s what I do on my off-time. I like to say that for my day job, I’m a fine art painter. Well, between playing Bum and painting, you’re quite the renaissance man. Yeah, who would think? Bum, a renaissance man. I love it! Was Bum on the original Dallas? I can’t remember. No this character is an invention of the new show. JR never had a regular PI in the classic show. At that time he always had a Dallas PD cop (McSween then Ratigan) in his back pocket instead. Well that answers my question about what was the last JR scene to be recorded. I’m also glad we got that cleared up, Dan. great interview. love that guy. great character. thanks. Also, Josh Henderson had his best moment in the grave scene. Thanks Daphne. You’re very correct: Josh Henderson is great in that scene too. I agree. Thanks for mentioning Mitch Pileggi. He’s great too! I feel that they should tell Kevin Page right away that he will be needed next season. I would hate for Dallas to lose him to another show. The scene with Sue Ellen and Bum was great and they did have an entertaining chemistry. Sue Ellen likes to flirt and Bum is happy to oblige, in my opinion. In my own interpretation of the scene, Bum knows Sue Ellen wants something from him, his services, and she is being extra nice to him to do what she wants. Seemed friendly and innocent to me. I think it is so cool that Kevin Page reads Dallas Decoder. The scene next to J.R.’s grave was thick with emotion. It was great to get insight on it. His artwork is great. 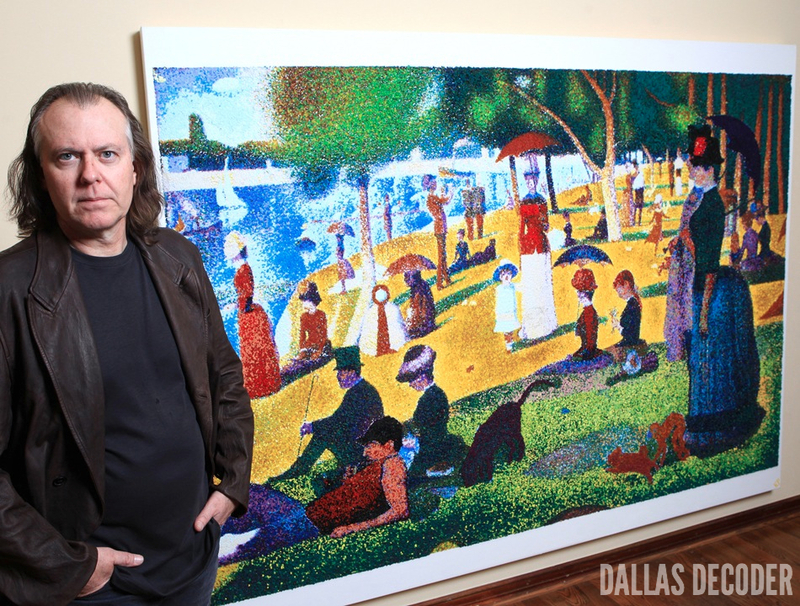 That is also so cool about his work with monumentally scaled pointillism. The link in the article http://youtu.be/nxBeSwlDREI to the youtube video is awesome!!! I hope his artwork and patented technology does not ever make him too successful to remain on Dallas!!! I’m glad you liked the interview, Jump. I want to see some of Kevin’s artwork up close. It looks really cool online. As always, thanks for commenting! Great interview, Chris! S glad you were able to interview Kevin. He is a great character on the show. I always enjoy his scenes. BTW…love your leading questions on the Bum and Sue Ellen scenes. That made me laugh when I read it…cuz ya know we all were thinkin’ the same thing when we watched that scene…..Bum and Sue Ellen are doing a little flirting there! And I can’t imagine shooting that graveside scene for that long. It must have been exhausting…..but it was so beautiful and poignant. Everyone did so well in that scene. I do hope Bum does come back…he adds a nice flavor to the show. I really like the supporting characters on this show. Heh heh. I couldn’t help myself, Hel. The flirting between Sue Ellen and Bum was too much fun. How could I not ask about it?! Glad you enjoyed the interview. Kevin is a terrific guy. Super cool and friendly.